This cold snap has dropped the water temp. down and pushed some of the bass off the spawning areas. So be sure to fish deep spots closest to and around those shallow flats. Crankbaits, spinnerbaits and plastic creature baits are all working well for the delta bass. 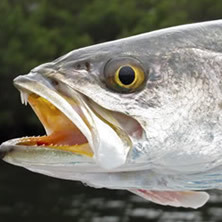 Speckled trout and redfish bite has picked up on the eastern shore artificial reefs (Dell Williamson Reef, Buddy Beiser Reef) down to point clear. Shrimp under a popping cork are catching on those reefs.